For the past seven days, I have worked 0400 - 1200 shifts. 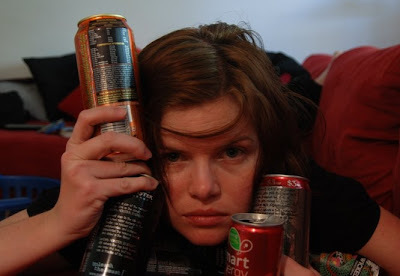 For the past seven days, I have consumed energy drinks - a different one every day. Funnily enough, I clicked on the comments specifically to say how much I like the blood orange chili one. Did you try "Insane Energy Drink" ? Red eye is my choice but as a rule energy drinks do littl or nothing for me. My sympathies on the shift. I'm old school-just give me a big chunk of extra-strength coffee and I'm good. Never had any of those newfangled energy drinks. Ain't the 'morning drive' shift fun? Oh, I was hoping to use your conclusions tonight. Got an assignment due by midnight and have been in insomnia hell lately. I guess these 4 red bulls are just going to have to do the trick. Congratulations on surviving your week! I've never managed to make it to the bottom of an energy drink. Even with the cute little thin cans. Sounds like you need a 12 hour sleep like I did last weekend! Kidneys are expendable. That's why evolution gave you two of the suckers. Drink up and good health. Will be only a distant memory. I use "V" as a tactical awake-ness tool for long drives. Not under any other circumstance. I could too easily get addicted (again). I had that face with the V cravings. 04:00 what are you worried about? the sun will be up in barely 2 hours. It's the getting up & into work by 04:00 that kills me. That and the 24:00 - 08:00 deck watch. I used to live on those Kopiko coffee lollies, until I worked out that they were giving me the shakes. Be ready for an ugly transition as your body clock resets.